I imagine it'd be difficult to be a vegan in Paris. It would for me, at least. There are simply too many non-vegan temptations--cheese, chocolate, yogurt, pastries. That said, there are days when I crave cleaner eats than the standard French diet provides. 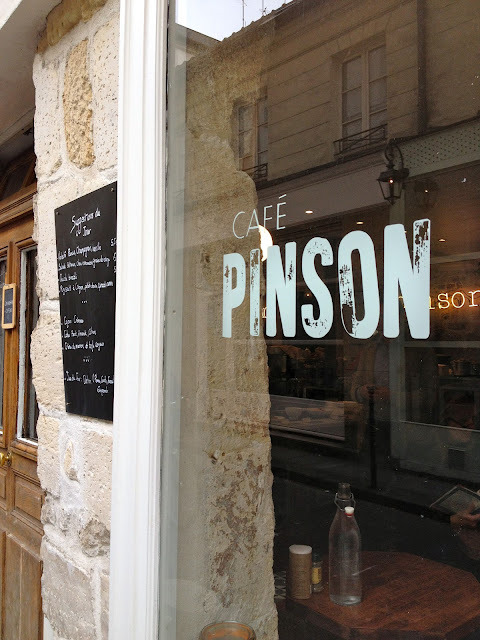 Take yesterday, when, following a long morning, I sought bobo refuge in the northern Marais to try the recently popularized Café Pinson. The late Fashion Week crowd was wrapping up their organic meals by the time I arrived. It was 2pm. I was starving. The smiling server at the counter helped me make my formule choices; one appetizer (soup/salad) and dessert, in addition to the pre-determined plat chaud. Fresh juices and coffee were also available. Upon seating, I appreciated the carafe de l'eau already on the table. Though the menu itself isn't explicitely defined as vegan, most of the plates are. I began with two salads of the day served alongside a box (a cardboard one) of bread. Then I moved on to a main course of "fried rice", onions, sweet potato, spinach, and cumin. And for dessert, a compote of orange and grapefruit--which, to be honest, was far too tart for my liking, but I suppose that should've been expected. 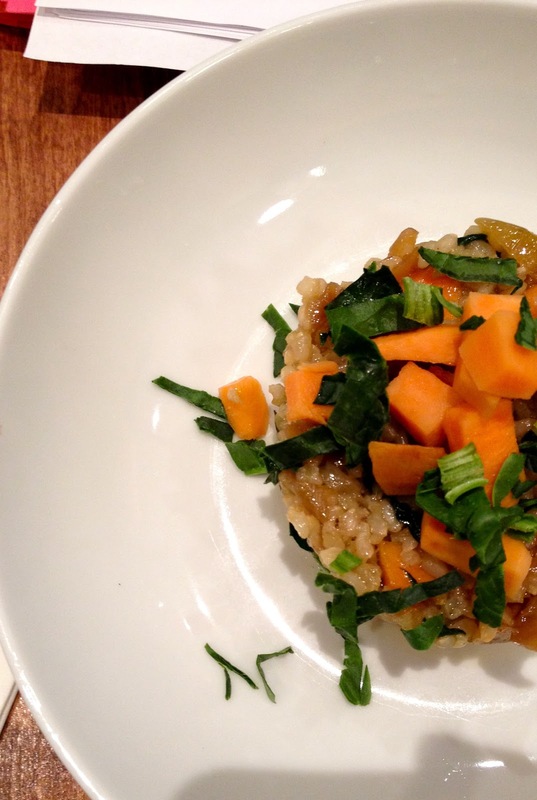 Overall, the meal was filling yet light and energizing; exactly what I'd hoped it be. Definitely worth the 17€. It was such an enjoyable solo lunch, too. 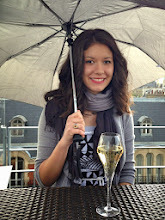 The relaxed environment in the midst of "modern-vintage Parisian" décor was perfect for a change of productive scenery. I'll be sure to make a reservation for their noteworthy brunch sometime soon. And while we're on the veggie-centric topic, a raw dinner at Pousse Pousse and vegan brunch at Soya are also on my list... as is Bob's Cold Press. I tried to snag a few juices to-go this afternoon actually... yet failed to note they don't open until March 19th. Oh well. At least now I know another place to go for my greens fix. Although I tend to prepare vegetarian meals in ma cuisine and shop at the Marché Bio des Batignolles whenever possible, a few extra nutrients are always appreciated; especially during midterms. That food sounds delicious and so healthy!